Greenville-Spartanburg International Airport (GSP) recently put the finishing touches on its $127 million Wingspan project, the largest capital improvement initiative ever undertaken at the South Carolina airport. 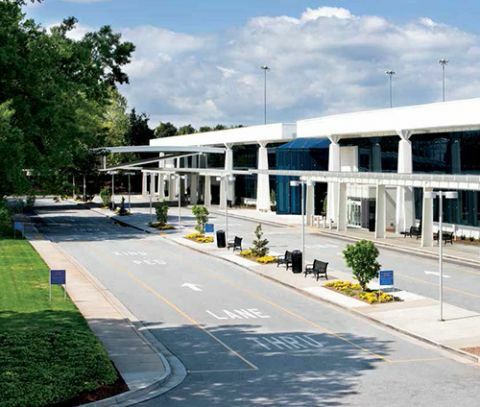 In essence, GSP completely rebuilt its terminal from the ground up, expanding from 225,000 to 375,000 square feet. All of the various elements were guided by three primary objectives: to correct functional deficiencies; increase and enhance amenities for travelers; and prepare the airport for future growth. Outbound Baggage Design: JSM & Assoc. Mechanicals: WB Guimarin & Co. Throughout the comprehensive five-year renovation and expansion, the airport not only remained operational, it continued to grow-from roughly 896,500 million enplanements in 2011, when construction began, to more than 1 million enplanements in 2016. Forecasters estimate the airport will serve approximately 2 million passengers by 2035. When enplanements hit 1.5 million, the design allows for the addition of five more gates and three more baggage claim carousels. Currently, GSP has 13 gates and three carousels. With specific needs identified in 2003, by 2009, it was time to start pushing forward, Edwards states. GSP hired RS&H to perform a terminal development study to determine the best way to proceed: build a new terminal on a greenfield site or renovate and rehabilitate the existing facility. In the end, GSP officials chose the latter, because projected costs for renovation/rehabilitation were approximately 25% of what a new terminal would have cost. Although the airport would save money by rehabilitating its existing terminal, the project and process would be exponentially more complex. As program manager for the project, Jacobs was deeply embroiled in the associated complications. Louis Mosley, southeast business leader for the firm, notes that in terms of cost and quality control, GSP's recent renovation and expansion was one of the most "surgically precise" projects he's ever been involved with. "Just building a new terminal next to the old one and then making the switch, that makes it real easy," he contrasts. "But essentially rebuilding an existing terminal from the ground up while remaining operational, that requires surgical skills." The project demanded a unique management strategy due to its scope, associated budget controls and the need to maintain efficient airport operations, he adds. Jacobs consequently used what Mosley calls the "plan-do-check-act approach," whereby team members continuously revisited plans throughout construction to ensure that progress remained in line with goals and objectives. Developing a precise and logical phasing program that would limit disruptions to airport operations and passengers' travel experience was critical, he reflects. RS&H Principal and Vice President Stephen Harrill describes the process as "a shell game of moving people around to get the renovations done." Phase One, the enabling segment, moved rental car counters out of the baggage claim area into enclosed, air-conditioned spaces in one of GSP's two parking garages, near the rental car pickup area. Crews also tackled the first phase of a future bag claim area by replacing and/or adding new sewer lines and electrical/communications duct banks. 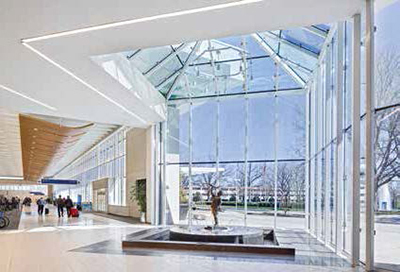 During Phase Two, contractors renovated Baggage Claim and replaced the front façade of Baggage Claim and Ticketing with a glass curtain wall. The airport also added new restrooms and concession spaces at the ends of the two concourses to prepare for shutting down existing concessions in a later phase. Phase Three, included the removal and reconstruction of the second-level bridge in the middle of the terminal to create a centrally located consolidated security screening area. The new TSA checkpoint connects to a new airside great hall with future concessions and access to the two concourses on each side of the hall. On the first level, crews finished the ticketing lobby and installed a completely new inline baggage system. Phase Four, the final portion, included construction of new administrative offices, a conference center and a landside hardscape area. Early in the project, GSP installed a shared-use platform to facilitate the necessary movement of airline ticket counters and gates throughout construction. The airport's new system, EASE(tm) by AirIT (now Amadeus Airport IT), allows airlines to share ticket counter and gate resources without having to move their equipment. Porcelain Tile, Terrazzo Flooring, Art Logos: David Allen Co.
"Moving an airline around from one gate or counter to another creates a lot of difficulties during construction," says Chris Keller, the company's president and chief operating officer. "The EASE system allowed airlines to use their own native applications at any ticket or gate counter. We also installed our flight information display system software and the IED audio paging system to support dynamic signage changes and announcements for the airlines." Although GSP did not pursue certification for the project from the U.S. Green Building Council, officials did keep an eye on sustainability. Notable elements of the newly renovated terminal include rain harvesting, solar water heating, use of natural daylight and high efficiency heating, venting and air-conditioning equipment. In addition, most of the building materials were regionally sourced, and contractors recycled demolition materials. "From a sustainability point of view, if it didn't prove to have a return on investment, we didn't do it," Edwards states. "It had to be fiscally responsible as well as sustainable." Participating via a joint venture, Skanska-Moss provided construction manager at risk services throughout the project. Scott Cannon, executive vice president and general manager for Skanska's Georgia/South Carolina operations, notes that at peak times, 250 to 300 workers were on site. During the day, contractors worked behind walls. Work in gate areas that could not be walled off was completed at night. Worksites spanned from the parking garage and ticketing lobby to the TSA checkpoint and concourses, Cannon remarks. "We were interfacing with travelers throughout virtually every area of the terminal," he recalls. "All of these areas were seamless and tied together. When we were planning the phasing of this project, it was critically important that we made sure the airport maintained operations and customer service." While barricades and temporary walls were important, effective signage and wayfinding cues were key to helping travelers negotiate their way through all the construction activity, he adds. "From parking to getting on the plane, we became part of the passenger experience. Upon completion of the project, we can say that we had no serious issues. It was a huge success." After moving through Ticketing in the center of the newly renovated terminal, passengers take escalators to the second level, where they pass through the security checkpoint and into the great hall. Inside the hall, a newly constructed glass curtain wall opens onto an outdoor deck that overlooks the rebuilt airside garden. Looking back toward the landside, travelers see a large fountain through the glass wall and glass canopy. Departing travelers take escalators up one more floor to access the concourses on the third level. Improving public circulation throughout the terminal was an important consideration, notes Harrill. "Arriving travelers now use exit corridors at the ends of the two concourses," he explains. "The design keeps arriving and departing passengers separated, so they don't cross at any point. We wanted to make it as intuitive as possible for departing passengers to get to their gates and for arrivals to get to the baggage claim area and ground transportation." When discussing design considerations for the new terminal, airport officials were clear that they didn't want to obliterate the old terminal's midcentury industrial-modern aesthetic. They were proud of GSP's history and wanted to update the terminal with a more modern look and feel-mix the old with the new, explains Harrill. To that end, the building's precast concrete roof panels and air-conditioning ductwork were left exposed in the interior ceiling areas, but the new glass curtain wall replaces a good portion of the landside exterior concrete wall. Perforated metal panels with a wood finish conceal new mechanical, electrical and sound systems. The relationship between the terminal's interior and exterior is very important, emphasizes Bob Anderson, associate vice president of architectural firm Michael Baker International. The airport is set in a unique location, "basically within a botanical garden," as Anderson describes it. Visitors are greeted by a large waterfall and green space as they approach the terminal. Inside, travelers encounter five water features: two in landside areas, two more as they move through Security and yet another in the airside garden. "The old terminal [which was built in 1962] was very closed off and let in little light with its high clerestory windows," Anderson remarks. "Now, with the huge glass curtain wall, I can stand on the second level and for the first time in 50 years look back through the glass wall to the big green lawn and the fountain out front. It makes a big difference in how people experience the airport." Response from stakeholders and the public has been overwhelmingly positive, Edwards reports. 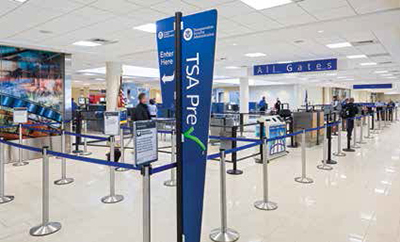 After five years of construction, GSP delivered a virtually brand new terminal to the community using only cash reserves and federal funding (about $20 million in Airport Improvement Program funds and $2 million in TSA grants). "There's no bond money or borrowed money involved," Edwards proudly states. "We don't have passenger facility charges here, so that wasn't part of the mix. This airport is run like a business. We do things because they need to be done, not because they might be a nice thing to do." When the project got underway, approximately 56% of GSP's primary traffic was linked to Hartsfield-Jackson Atlanta International and Charlotte Douglas International via connecting flights. "We have turned that around over the past eight years," Edwards reports. "Part of the reason for that is we are providing better facilities." Reflecting back on the Wingspan project, Mosley was reminded of an anecdote he heard early in his career. "Someone told me that on the first trip to the moon, the spacecraft was off course 98% of the time. But through constant planning, checking and making course corrections, the ship always got to where it needed to be. To the credit of all the stakeholders, that's what happened here."